After exiting the Cavern of Earth with the Star Ruby in hand, you should head through the valley, and then go northwest. You will soon see another cave, one that is considerably smaller than the Cavern of Earth. Welcome to the Giants Cave! Upon entering the Giant’s Cave, you’ll first notice the Giant. It seems that he has quite an appetite, but not for traditional food. 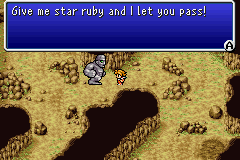 Hand over the Star Ruby, then go and make a sandwich. You’ll have that much time as the Giant walks very slowly. After he disappears, follow the path to the south. There is some excellent treasure here. 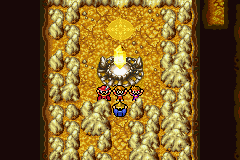 Once you have collected the treasure, head to the northern part of the cave. The exit should be quite obvious. Back on the overworld, follow the path south. It winds a little, but there is no way to get lost. After a short distance you will see, you guessed it, another cave! This is the home of the Sadda the Sage. The place looks doesn’t look very inviting, and there are empty bottles all over the place. Head through all the rooms until you find Sadda sitting at a table. After telling him of your journey, he will provide you with a crowbar, I mean rod. It seems that this tool is capable of removing the floor plate that prevented us from reaching Lich. Om nom nom nom. What a waste of a Ruby. Exit Sadda’s house, and then proceed back to the Cavern of Earth. Stop at Melmond if your MP and HP are low, and restock any items that you may need. When we enter the Cavern of Earth this time, we aren’t coming out until we have the Earth Orb! After reaching the room the belonged to the Vampire, continue deeper in the cave until you find a plate of the floor. Walk up to it and use the rod to remove this obstacle from your path. Take the ladder down to the next floor. The only treasure worth collecting on floor B4 is money. Be careful, as many of the treasure chests have Ogre Mages or Sphinxes guarding them. Neither monster should be much of a threat, but be aware of their locations so that you don’t trigger a battle when you aren’t prepared. 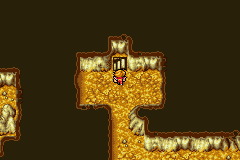 Collect the treasure if you wish, then proceed to the final floor. There is no treasure on floor B5, save for the Earth Orb. Follow the path until you reach the room in the west. Heal all of your characters before entering the chamber. Lich awaits! I don’t know what I was expecting, but it definitely wasn’t another staircase. 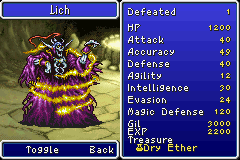 This is a difficult battle, but like the Vampire before him, Lich is undead. Use his weakness to fire to your advantage. You should have your Black and Red Mages cast fast on your melee fighters as soon as possible, then attack Lich with fire spells. Your White Mage should cast NulFrost, then NulBlaze, and then heal as necessary. Lich has the highest defense and most HP of any boss you have fought so far, so expect the battle to drag on for a little bit. Once the screen flashes white, you can breathe a sigh of relief, as you have just defeated the first Fiend! After Lich falls, the Earth Orb will be lit once again. Move to the back of the chamber and step on the plate to teleport back to the surface. As you may have noticed during the cinematic scene, Earthgift shrine is now open. You can visit it if you wish, but there is no treasure there that is better than what you already have. More details about the bonus Soul of Chaos dungeons can be found in Chapter 12: Soul of Chaos. In the words of Borat, “GREAT SUCCESS”!